This is a fast and easy recipe to make on a night when you really just want to eat and not cook. It’s gluten and dairy free and full of the most amazing flavor. This recipe will make enough for 12 tacos with leftover filling for an omelet the next morning. This recipe was also shared with the NFCA and is featured as their Recipe Of The Week. If you have not visited their website yet you might want to see all of the great information they have to share. *See notes for substitution ideas. First thing you want to prep is your purple sweet potato. Peel and dice it and add it to a microwave safe bowl with water. Cook on high for 6-10 minutes until they have started to soften. The length of time will depend on your microwave. Pre-cooking these potatoes while you are getting everything else ready, will go a long way to getting this dish cooked up fast. Heat your pan on medium high and then let the coconut oil melt. Add in your diced onions and cook until soft. I like to remove these to a serving bowl while I cook the chorizo so they don’t over cook. Remove the chorizo and add the purple sweet potatoes to the pan. When they have browned remove them to your serving bowl and toss the scallops into the pan. Make sure they are dry before adding them to your pan or they will steam and not brown. Although I find it difficult to brown the smaller bay scallops as compared to the large sea scallops. Warm your tortillas and keep them wrapped or covered on your table. Once they scallops are cooked add them to your serving bowl along with the cilantro. Mix it all together and taste. You may or may not want to add any salt and pepper. The chorizo is so full of flavor and seasonings that I didn’t need anything else. You may feel differently. At the table spoon the mixture into your tortilla, fold in half and eat. It doesn’t even need any salsa but if I were going to try some it would definitely be a Creamy Tomatillo or Regular Salsa. You can substitute a white potato for the purple sweet potato. I found the purple sweet potatoes at the International Market. 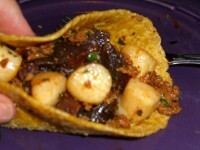 You can substitute the large sea scallops for the smaller bay scallops if that is what you have on hand. Just cut them into bite size pieces after you cook them. If you don’t like or have scallops you can substitute shrimp. Thanks Alta! If you have chorizo that comes in a casing and it’s fresh, take it out of the casing to cook. If it’s cooked links just dice it so it will be smaller than the potatoes. You can also use homemade tortillas which would make this dish taste even better. This sounds so lovely. 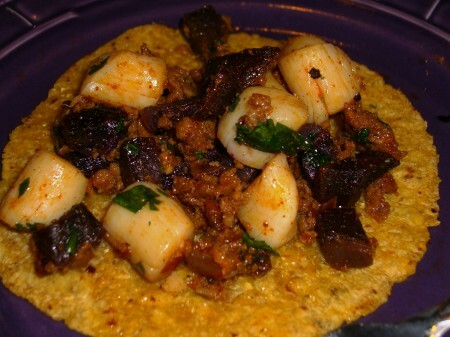 I have always wondered what anyone did with those tiny bay scallops – this is a great way to use them. I'd also love these with shrimp. Alta- I'm headed back to the store for more purple sweet potatoes to cook up with shrimp! How creative. Looks good to me. looks so savory and delicious…can I have a bite? Beth- sure thing, I always make extra. Mr. GFE might not ever let me go back to basic tacos, if I start making these. (I'm not kidding.) Wow, they look amazing! I'm imagining all the flavors. Incredible … really. Shirley- You know it was so much easier than regular tacos I may not go back either.